This is a place to practice inline skating. 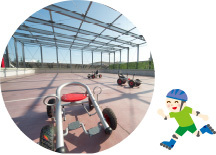 There is a net so children can safely play ball and ride around. 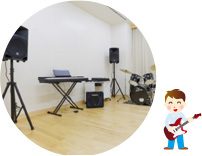 There is a Music Studio equipped with a drum set and keyboard that are always available, and a Dance Studio with big mirrors. Children can give shape to their imagination and ideas here doing such activities as making seasonally themed crafts and creating handmade toys. 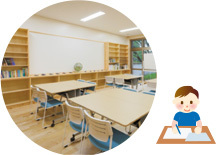 The Learning Room is a place where children can study and read. Depending on the time, the room can also be used for other purposes like meetings. 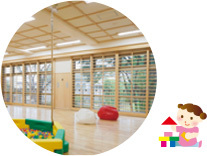 Children can play with building blocks and a play house, and there are also board games to play such as Shogi and Othello. We sometimes have a “Toy Library” here. 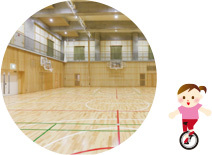 In the Arena, children can play sports games like basketball and badminton. There is a stage, so that you can give a concert or performance. 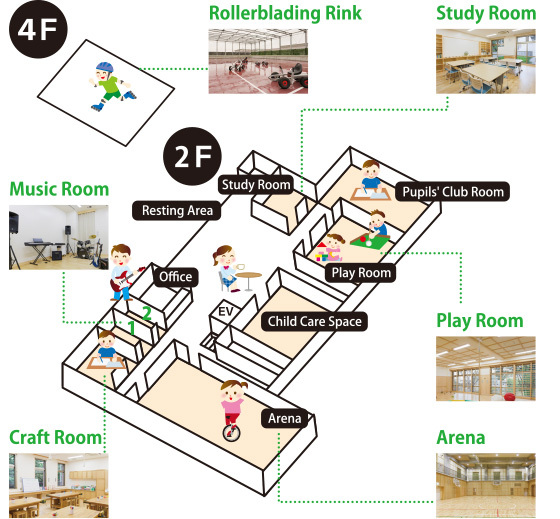 The Resting Area is a place where children can relax freely, and eating and drinking are permitted here. 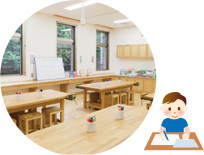 Children can also read picture books and other materials in bookshelf nearby.